This article is about the obstacle. For the move in Super Mario RPG: Legend of the Seven Stars, see Skewer (move). Skewers (also known as Spikes and Spike Pillars) are gray, blue, black or green pillars with spikes on them. First appearing in Super Mario World, they can either power-down Mario or crush him for an instant life loss. In later titles, however, the Skewers can only power-down Mario. 1.4 Wario Land: Shake It! Originally appearing as light gray stone pillars in fortresses and castles, the Skewers are all vertical in Super Mario World, moving up and down, while also blocking the player's path. The Skewers are solid obstacles that can damage the player upon contact, and they can even cause an instant life loss if the player is caught between a Skewer and the ground. There are usually several of them in a row which have to be timed. Skewers appear as an obstacle, alongside Grinders in #6 Wendy's Castle in the first room, the Valley Fortress as the main traps of the level (moving faster in the final section), and Bowser's Castle in door number 5. Unlike Wendy's Castle and Valley Fortress, the Skewers in Bowser's Castle come down slowly, but can still cause an instant life loss if the player gets crushed by them. There are also some yellow miniature ones without spikes (resembling pencils) in Chocolate Fortress and #7 Larry's Castle. Skewers returned (including some horizontal ones now) in New Super Mario Bros. (now metallic military green with yellow spikes). They appear only in World 3- and World 6- . Unlike in Super Mario World, they are not treated as solid objects, and can't instantly take out Mario, unless he's small or mini. Shell Mario can also duck in a Skewer's path without taking damage. A giant Skewer in World 6- , from New Super Mario Bros. Wii. Skewers, referred to as pistons in the Prima game guide, make a comeback in New Super Mario Bros. Wii, where their coloration is now definitively black and they now spin as they move. The game also features a very long and extremely fast Skewer that runs along the floor for the length of a long room in World 4- , and very large vertical ones in World 6- and World 7- . The sound they make is that of a large sliding gate slamming. Two Skewers, from Super Mario 3D Land. Skewers from New Super Mario Bros. Wii make a return in the Nintendo 3DS game, Super Mario 3D Land, making their first appearance in a 3D Mario game; they are no longer in castles, instead appearing on airships. They cannot be destroyed, even while invincible; as Statue Mario or Invincible Mario (including White Tanooki Mario), they are like walls if run into with these powers. In New Super Mario Bros. 2, Skewers make a reappearance. However, unlike past New Super Mario Bros. installments, they are blue, and they appear only in one course, World 3- , which is water-filled course, and only horizontal Skewers are featured. Skewers also appear in New Super Mario Bros. U, where they are found only in Giant Skewer Tower. All of the Skewers are horizontal and are once again black with gold spikes as in New Super Mario Bros. Wii, and their lengths vary. The Skewers also appear in the New Super Luigi U course, Shish-Kebab Tower, but they move at faster rates than in New Super Mario Bros. U.
Skewers, as they appear in Super Mario Maker. Skewers return in Super Mario Maker as an addition in a software update that was released on March 9, 2016. They function identically to their previous iterations, activating every few seconds, but with some differences. Their tips have been flattened, they come with a base that they shoot out of, and have a maximum length of 13 blocks long, plus the base, unless they hit terrain. They will tear through bricks unhindered, and also are able to destroy other harder blocks, but will stop and recede after doing so. They can also be added to any of the four game styles, including the original Super Mario Bros. and Super Mario Bros. 3, where they had never appeared before. In these 8-bit adaptations, they are largely black, with some gray scaling on the edges, and spikes; the points are white, with the sides of the spike as gray. There is a little bit more detail on the Super Mario Bros. 3 version. In the Super Mario World style, a new sprite was made instead of using the old one. Skewers can be used by shaking the Thwomps; however, they can't be enlarged with Super Mushrooms. In Super Mario Maker for Nintendo 3DS, Skewers are standalone course elements and are no longer created by shaking a Thwomp. The regular Skewers from the game also appeared in the Super Mario World cartoon, in the episode "Mama Luigi". These obstacles also appear in the minigame from Mario Party: Island Tour, Kabob and Weave, where players must simply avoid them. 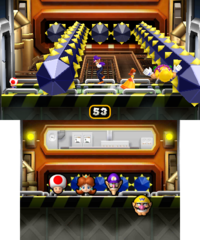 Skewers reappear in Mario Party 10 in the minigame Skewer Scurry, and appear as an obstacle in Chaos Castle on the unlucky spaces to take away mini stars from the player. In Wario Land: Shake It!, Skewers are featured only in underwater levels. If Wario inside his Subwarine comes in contact with these, the Subwarine will take damage reducing Wario's heart health to half. Jagged Jewels, a Key Temple level in Donkey Kong Country Returns and Donkey Kong Country Returns 3D contains some cylindrical Skewer-like obstacles, referred to as spiked shafts in the Prima guide. These are encrusted with rows of sharp purple jewels, serving as spikes, and end with a large, similar pointy gem on their top. 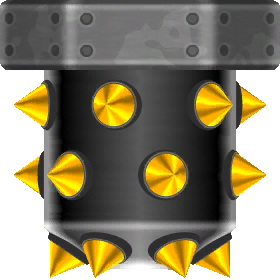 Much like the Skewers in the Mario games, spiked shafts are indestructible; they shoot vertically, moving back to their starting point after a strike and repeating the action. Their movements are quick, but they always signal their darting with a brief tremble. Notably, two Puzzle Pieces are found at the tips of two spiked shafts, moving along with them. Skewers from Super Mario 3D Land also appear in the stage based on the game, 3D Land, in Super Smash Bros. for Nintendo 3DS and Super Smash Bros. Ultimate, where they rise from the water and can destroy part of the stage's platforms (which resemble Switchboards from Super Mario 3D Land), as well as hit any players who touch them. Skewers make a minor appearance in Mario & Luigi: Paper Jam, where they are found in Neo Bowser Castle in the lava pit. A Skewer, from Super Mario World. A Skewer, from New Super Mario Bros..
A Skewer from New Super Mario Bros. Wii. A Skewer, from Super Mario Maker (Super Mario Bros. theme). A Skewer, from Super Mario Maker (Super Mario Bros. 3 theme). A Skewer, from Super Mario Maker (Super Mario World theme). Fox McCloud and Mega Man, hit by Skewers in Super Smash Bros. for Nintendo 3DS. Skewers, as they appear in Mario Party 10. ↑ Nintendo Mario Mania Player's Guide. Pages 142-143. ↑ Super Mario 3D Land Prima eGuide, World Three tab. ↑ New Super Mario Bros. Wii Prima Official Game Guide, pages 88, 121, 148 & 149. This page was last edited on April 5, 2019, at 21:32.